We are excited to announce the formation of a new Member Council that is designed to formalize the relationships among immigrant-led cooperators who are seeking a space for peer advising. We are launching the Member Advisor Council Immigrant Cooperatives in January 2017. Email membership [at] usworker [dot] coop for details. The largest growing segment of worker cooperatives in the United States are immigrant-led cooperatives. A majority of those workplaces are dominated by Spanish-speaking members. 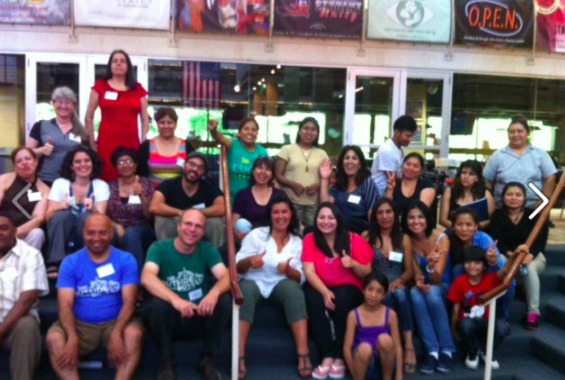 The US Federation of Worker Cooperatives and Democracy at Work Institute has noted that there is a deep interest and desire on the part of Immigrant worker owners to be connected. The goal would entail that representatives of immigrant-based coops bring in business-related issues (i.e. legal model, governance, marketing, and relationships with developers, as well as challenges and stories of success) and receive peer support from other worker-owners, referrals to resources, and they identify tools that need translation. In turn, through the strengthening of relationships and reliance on one another, the group collectively plans for how to address the issues that are raised. The format for providing peer advising would involve a process called peer consultancy. Additionally, the council would identify needs within worker coops that can be addressed by the USFWC through advocacy, member benefits, etc. or through DAWI via the creation of tools, training, research or communities of practice. The overall expectation in forming a [Spanish] Member Council for Peer Advisors is for the participating cooperative businesses to be more self-functioning. Estamos muy emocionados de anunciar la formación de un nuevo Concilio de Miembros pensado en la formalización de las relaciones entre cooperativistas inmigrantes quienes están buscando un espacio para la asesoría mutua. Estaremos celebrando la primera reunión del Concilio de Miembros Asesores de Cooperativas Inmigrantes en Enero de 2017, estén pendientes. Pueden comunicarse a nuestro correo para más detalles membership [at] usworker [dot] coop. Las cooperativas lideradas por inmigrantes constituyen el mayor grupo de crecimiento de grupos de cooperativas de trabajadores de los Estados Unidos. La mayoría de estos espacios de trabajo son conformados por miembros de Habla Hispana. La US Federation of Worker Cooperatives y Democracy at Work Institute ha notado que hay un interés y deseo por parte de los trabajadores propietarios para poder conectarse directamente. La meta será que representantes de cooperativas lideradas por inmigrantes puedan traer a la mesa sus conversaciones relacionadas a sus negocios (por ejemplo, el modelo legal, gobernanza, publicidad, relaciones con desarrolladores, así como retos e historias de logros) y recibir apoyo mutuo de otros trabajadores propietarios, referencias a recursos y materiales, así como identificar herramientas y materiales que necesitan ser traducidos a otra lengua. En resumen, a través del fortalecimiento de las relaciones y el apoyo entre unos y otros, el grupo podrá planear colectivamente cuáles son los tópicos que necesitan atención y cómo resolver problemas. El formato para ofrecer asistencia mutua involucra un proceso llamado consultoría mutua. Adicionalmente, el Concilio podrá identificar las necesidades de los trabajadores cooperativas que puedan ser atendidas por la USFWC a través de la abogacía, beneficios de la membresía, etc. o a través de DAWI con la creación de materiales, herramientas, capacitaciones, investigación o prácticas de comunidades. La expectativa en general de formar este Concilio de Miembros de Apoyo Mútuo es para que las cooperativas de negocios participantes logren incrementar su capacidad de auto suficiencia.